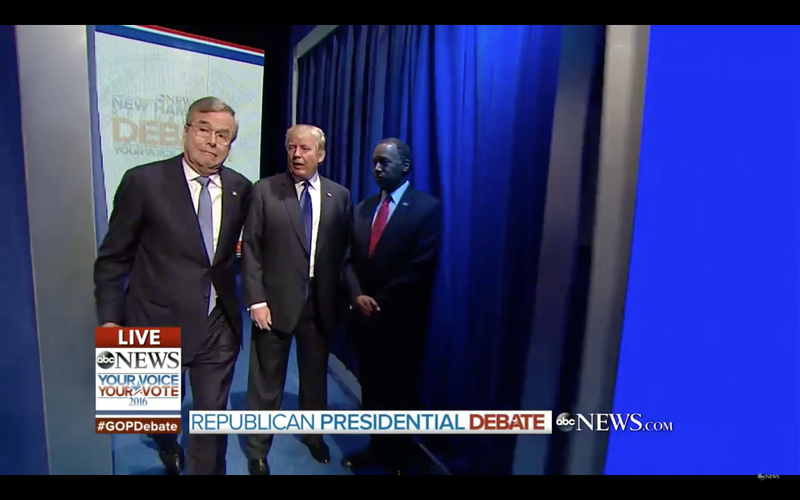 As with all debates, there were literally thousands, if not tens of thousands of body language moments during Saturday night's Republican debate in Manchester - just three days before the 2016 Primary in New Hampshire. Below are but four body language moments which occurred during the introduction. Apparently the applause was so loud, that several of the candidates didn't hear their names being called. Ben Carson was the first to make this mistake. 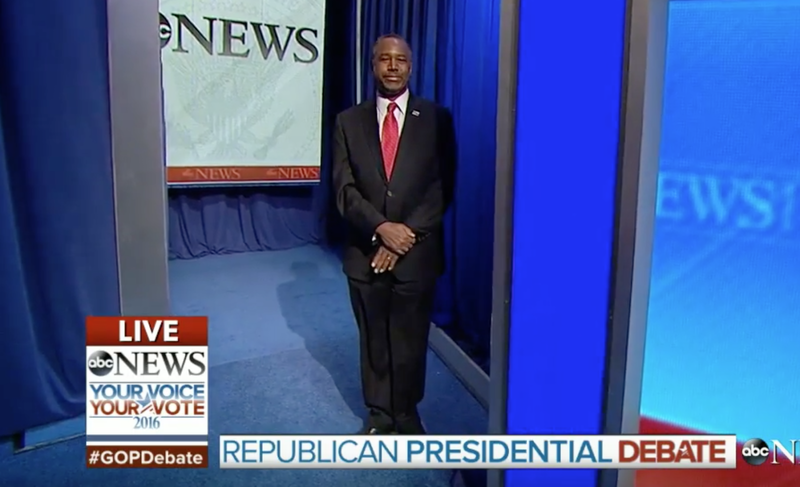 While waiting, Ben Carson made the profound mistake of standing in a configuration that no Presidential Candidate should ever do during a debate (or indeed anywhere with the rare exception of a religious ceremony, meeting a major religious figure, a wedding, a funeral, while at The Tomb of the Unknown Soldier, etc.). 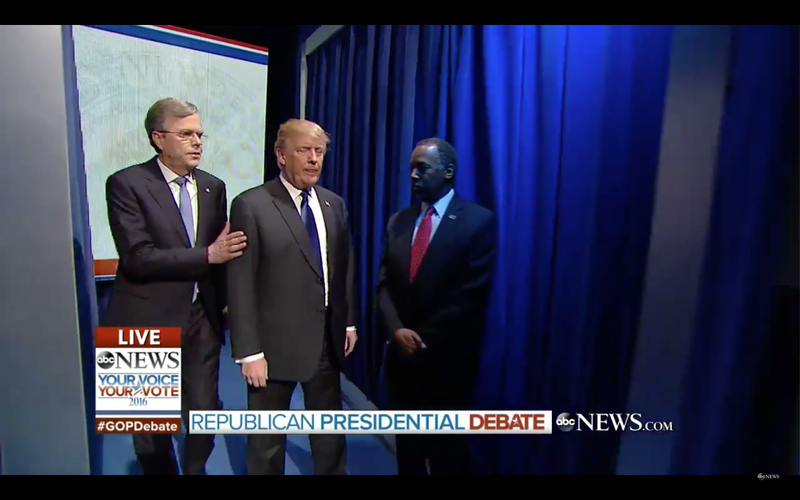 As seen in this image, while waiting for his name to be called (and it already had been) - Dr. Carson is standing with his feet together while his hands are held in a fig-leaf variation. This stance carries with it an extremely beta emotional tone. 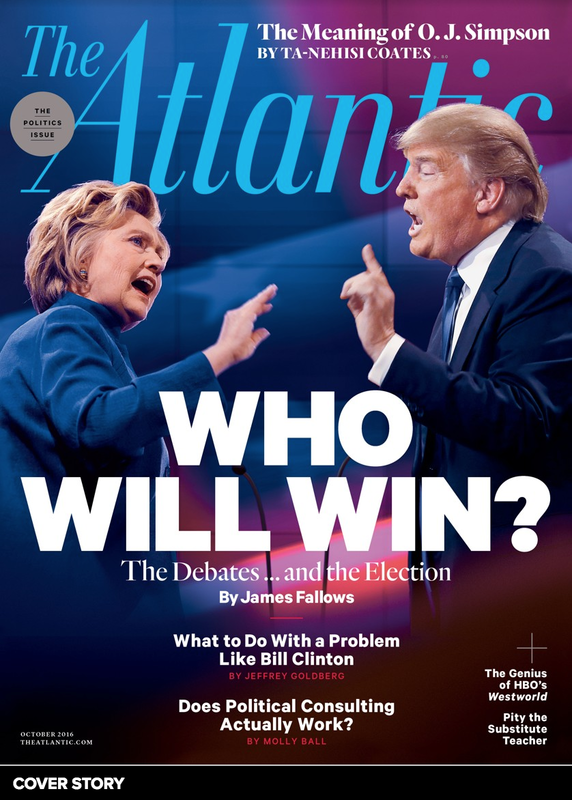 Not only will this send signals of acquiescence to his opponents, but it also will down-regulate the all the alpha qualities of confidence, strength, assertiveness, etc., which are needed during a such a high level political debate (or any debate). It's impossible to believe any debate coach or body language expert ever recommended this behavior to the brain surgeon. 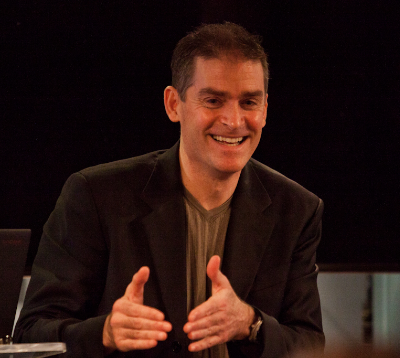 The damage done by this nonverbal faux pas cannot be over-emphasized. There's simply no way a person who stands in this manner will ever win a high-level debate. 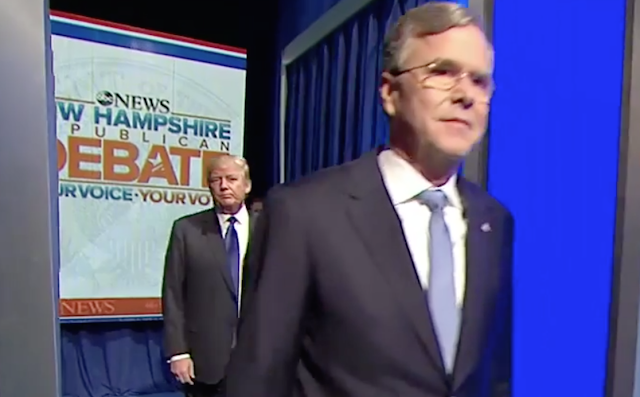 When Jeb Bush passes by Donald Trump, Bush of course, touches Trump's upper arm. Most of the candidates committed this or a very similar intimate space invasion - which in almost any other setting should be strongly discouraged - yet here it serves to help disturb their opponents and displace them from their emotional "game face" baseline. Here the former Florida Governor displays a classic, Social Fear Face - which is nonverbally shouting, "I'm glad you guys screwed up and not me." It's important to note that those who display this expression for others (even here, Bush for his own opponents) have higher empathy quotients. After Bush passes him, Trump displays a classic contempt display with a component of regret. Dating & Romance Nonverbal Communication Secret No. 1010: Rashida Jones - What Makes the Twinkle in Her Eye?